A great deal of speculation has been written about major events predicted in the Book of Revelation. Inevitably, the result is a misconstrued scenario of the ‘end times’. It may surprise readers to learn that some of the most popular ‘end times’ topics taught today, do not actually appear in the Scriptures. My articles ‘Dispensationalism’s ‘The Antichrist’ is not Mentioned in the Bible’, and ‘Jesus Never Mentioned a Millennium Reign?’ explain my view in detail. There is no doubt we are living in uncertain times; sadly, a world war is within the realm of possibility. Nevertheless, political leaders should not succumb to the promulgators of grossly exaggerated ‘end times’ theories. Dispensationalism’s ‘Battle of Armageddon’ has no bearing on the calamities that may befall our generation. 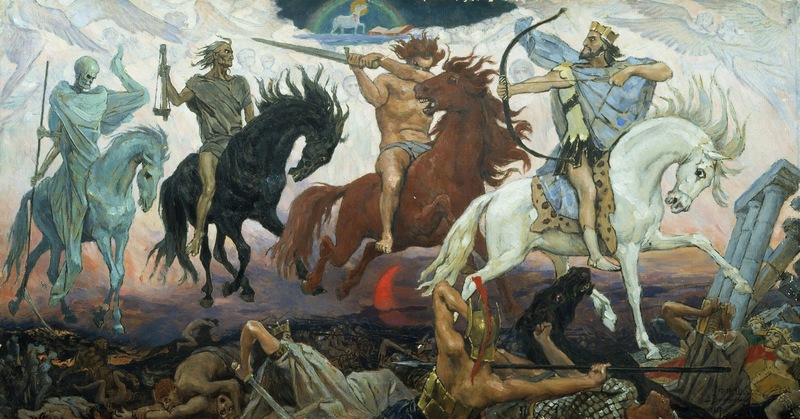 The purpose of this article is to examine whether Dispensationalism’s claim is justified that ‘the Battle of Armageddon’ is an impending, world ending event. I will attempt to explain what John meant by ‘Armageddon’, and affirm its AD 70 timeline. Adam Clarke (1760-1832) predicted future ‘self-inspired prophets’ would continue ‘Armageddon’ speculation whenever a warmongering dictator appears on the scene. Predictions continue to this day, the only difference is the greater degree of exaggeration. Some leading authors, preachers, and TV personalities, who insist on a literal interpretation of the Scriptures, now claim John and the prophets described 21st century helicopters and nuclear bombs! The ‘Battle’ or the ‘Gathering’ of Armageddon? It is important to understand the context of Revelation 16:16 because it is the only occasion Armageddon is mentioned in the New Testament. It is astounding the innumerable sermons, books, and movies inspired by one verse of Scripture. Rev 16-16 KJV And he gathered them together into a place called in the Hebrew tongue Armageddon. John wrote they ‘gathered’ at Armageddon, the ‘battle’ of Armageddon is not mentioned at all. Nevertheless, it has not deterred imaginations from running wild. Rev 16:1-2 KJV And I heard a great voice out of the temple saying to the seven angels, Go your ways, and pour out the vials of the wrath of God upon the earth. 2 And the first went, and poured out his vial upon the earth; and there fell a noisome and grievous sore upon the men which had the mark of the beast, and upon them which worshipped his image. In my opinion, the Armageddon timeline was during the 1st century AD when the wrath of God was unleashed upon unrepentant Old Covenant Israel. The religious leaders and their misguided flock were the recipients of God’s judgement. The first vial of judgement was poured out on those having accepted the mark of the beast. The final outcome was the destruction of the temple, Jerusalem, and the dispersion of the nation. My article ‘Dispensationalism’s ‘The Antichrist’ is not Mentioned in the Bible’ explains my view on the beast and his mark. I agree with Frank Di Mori, the ‘Bible Prophecy Man’, that the gathering at Armageddon was not to battle, but to commence a campaign against Jerusalem. Rev 9:16-17 KJV And the number of the army of the horsemen were two hundred thousand thousand: and I heard the number of them. 17 And thus I saw the horses in the vision, and them that sat on them, having breastplates of fire, and of jacinth, and brimstone: and the heads of the horses were as the heads of lions; and out of their mouths issued fire and smoke and brimstone. However, I disagree with him that 200,000,000 horsemen from the East will literally gather in the near future. Frank Di Mori attempts statistically to support Dispensationalism’s view that a literal 200 million army could be formed by eastern nations, obviously, maths is not his forte. His statement accounts for 8,370,000, apparently the outstanding 191,630,000 have gone AWOL. http://www.globalsecurity.org/military/world/armies.htm, makes interesting reading on this subject. Is there any need for an army of 200,000,000 horsemen from China and eastern nations in this technological age? It is logistically unlikely, since there aren’t that many horses in the world. Surely, he doesn’t believe this army will literally travel and fight on horseback. On a positive note, it would be a good year for the roses. John described figuratively an overwhelming demonically inspired army! I believe the campaign was the Roman/Jewish war of AD 66-AD 70. The Roman Empire was God’s instrument of wrath during the final judgement upon Old Covenant Israel in AD 70. There are numerous examples in the Old Testament where God used neighbouring nations to fulfil His promised judgement on a wicked nation. For example, Isaiah 13. My article ‘The Great and the Terrible Day of the Lord Is History’ examines this subject in detail. Rev 16:14 KJV For they are the spirits of devils, working miracles, which go forth unto the kings of the earth and of the whole world, to gather them to the battle of that great day of God Almighty. ‘and of the whole world’ According to Strong’s translation, the armies of the Roman World/Empire gathered for the battle of that great day of God. ‘So Vespasian sent his son Titus [who], came by land into Syria, where he gathered together the Roman forces, with a considerable number of auxiliaries from the kings in that neighborhood’.’ Book III, Chapter 1, Paragraph 3. It is possible to ascertain the 1st century Armageddon timeline from Scripture, since it would be at the close of the ‘great tribulation’. Therefore, if we identify the timeline of the ‘great tribulation’, we will establish when the Armageddon gathering took place. Mat 24:29-30 KJV Immediately after the tribulation of those days shall the sun be darkened, and the moon shall not give her light, and the stars shall fall from heaven, and the powers of the heavens shall be shaken: 30 And then shall appear the sign of the Son of man in heaven: and then shall all the tribes of the earth mourn, and they shall see the Son of man coming in the clouds of heaven with power and great glory. ‘Immediately after the tribulation of those days’ Most scholars object to the view that the ‘tribulation of those days’ and Christ’s return took place by AD 70, due to the lack of empirical evidence. However, if the stars were to literally fall from heaven, the earth would not survive the impact. Jesus used prophetic, figurative language commonly spoken by the Old Testament prophets. Isa 13:10 KJV For the stars of heaven and the constellations thereof shall not give their light: the sun shall be darkened in his going forth, and the moon shall not cause her light to shine. Isaiah used prophetic language to describe the downfall of the Babylonian Empire. This was similar to the language used by Jesus during the Olivet Discourse. Isaiah’s prophecy was not fulfilled literally; he explained the Lord’s method of fulfilment was the invasion of the Medes. Rev 1:9 KJV I John, who also am your brother, and companion in tribulation, and in the kingdom and patience of Jesus Christ, was in the isle that is called Patmos, for the word of God, and for the testimony of Jesus Christ. John and his generation lived during the great tribulation initiated by Caesar Nero. John encouraged the original recipients of the Revelation by aligning himself with them through the dreadful reign of the ‘man of sin’. Jesus described the great tribulation about to unfold during His generation’s lifetime. Mat 24:20-21 KJV But pray ye that your flight be not in the winter, neither on the sabbath day: 21 For then shall be great tribulation, such as was not since the beginning of the world to this time, no, nor ever shall be. ‘But pray ye that your flight be not in the winter, neither on the sabbath day’ If the great tribulation is a 21st century calamity involving the whole world, why would we pray that our flight not be on the sabbath day? It is obvious, the sabbath restrictions applied to Old Covenant Israel, not to the world 2000 years in the future. Jesus warned His generation of impending doom. ‘such as was not since the beginning of the world to this time, no, nor ever shall be’ Some futurists contend that the tribulation during the 1st century foreshadowed a 21st century tribulation. If so, why did Jesus declare there would never be another like it? Luk 21:12 KJV But before all these, they shall lay their hands on you, and persecute you, delivering you up to the synagogues, and into prisons, being brought before kings and rulers for my name’s sake. ‘and persecute you, delivering you up to the synagogues’ Luke wrote that those persecuted would be delivered to the synagogues. If the great tribulation is in the 21st century, will believers be delivered up to the synagogues? In Matthew 24, Jesus said all these things would be fulfilled during the lifetime of His generation. Many today insert a 2000 years gap in a vain attempt to negate the impact of the simplicity of Jesus’ statement. Rev 16:6 KJV For they have shed the blood of saints and prophets, and thou hast given them blood to drink; for they are worthy. Not only had Old Covenant Israel forsaken the Lord and the Law, the nation was guilty of shedding the blood of the martyrs. Rev 7:14-15 KJV And I said unto him, Sir, thou knowest. And he said to me, These are they which came out of great tribulation, and have washed their robes, and made them white in the blood of the Lamb. 15 Therefore are they before the throne of God, and serve him day and night in his temple: and he that sitteth on the throne shall dwell among them. The faithful who paid the ultimate price for their faith during the ‘great tribulation’, rejoiced in the presence of God. Rev 17:5-6 KJV And upon her forehead was a name written, MYSTERY, BABYLON THE GREAT, THE MOTHER OF HARLOTS AND ABOMINATIONS OF THE EARTH. 6 And I saw the woman drunken with the blood of the saints, and with the blood of the martyrs of Jesus: and when I saw her, I wondered with great admiration. Who shed the blood of the saints and prophets? It was Jerusalem’s religious leaders. Mystery Babylon was not Rome; it was Jerusalem. Jesus rebuked the religious leaders for killing the prophets the Lord had sent. Mat 23:35-36 KJV That upon you may come all the righteous blood shed upon the earth, from the blood of righteous Abel unto the blood of Zacharias son of Barachias, whom ye slew between the temple and the altar. 36 Verily I say unto you, All these things shall come upon this generation. Zec 14:1-2 KJV Behold, the day of the LORD cometh, and thy spoil shall be divided in the midst of thee. 2 For I will gather all nations against Jerusalem to battle; and the city shall be taken, and the houses rifled, and the women ravished; and half of the city shall go forth into captivity, and the residue of the people shall not be cut off from the city. Titus was about to fulfil Zechariah’s prophecy. The utter destruction of the temple and Jerusalem was accompanied by the death of an estimated 1,100,000 Jews and the enslavement of 97,000. Titus refused the victory wreath, and reportedly said he had not won the victory, but was only the instrument of their God’s wrath upon them. Zec 12:11 KJV In that day shall there be a great mourning in Jerusalem, as the mourning of Hadadrimmon in the valley of Megiddon. The great mourning was reminiscent of the mourning for King Josiah, who was killed in battle against King Necho of Egypt, in the valley of Megiddon. Josephus described the visible collateral damage, but not the spiritual warfare. However, John also witnessed the war in the unseen world between Christ the King and Satan with the forces of darkness. ‘The Day of God Almighty’ brought an end to Old Covenant Israel, and the establishment of the New Covenant Age. Jesus defeated all His enemies, it is time those ‘in Christ’ lived in the victory. Many appear to be continually swayed by every false prediction of Dispensationalism’s impending ‘Battle’ of Armageddon, with its doomsday scenario that is void of scriptural support. Having examined Armageddon and its timeline, I am convinced the event is history. ← Dispensationalism’s ‘The Antichrist’ is not Mentioned in the Bible!